For centuries, the empire of Cheliax stood as an example of humanity's greatness, with colonies and vassal states spread throughout the Inner Sea region. Then Aroden, god of humanity, died mysteriously on the eve of his prophesied return, and the empire fell into a vicious civil war. Seeking victory at all costs, the Thrice-Damned House of Thrune made pacts with the denizens of Hell to wrest control of Cheliax away from its rivals. While many of the empire's holdings have fallen away in the decades since, at its core, Cheliax remains powerful, both subservient to and allied with the legions of the Pit. Yet discontent looms throughout the nation, even as brash young Queen Abrogail II seeks to tighten her imperial grip on the populace. An overview of Cheliax's government, foreign relations, society, and history—including details House Thrune wants forgotten forever. An extensive gazetteer of the entire nation, offering more than 80 entries on such people and places as Brastlewark and its wily gnomes, the xenophobic strix of Devil's Perch, Kintargo and its rebellious citizens, and majestic Egorian's imperial sycophants. A breakdown of Chelish noble titles and the country's social hierarchies. Nearly a dozen new adventure sites ripe for intrigue and exploration, from a magical city ruined in the aftermath of Aroden's death to an isolated island where House Thrune secretly creates fiendish supersoldiers. Six hellish new monsters, plus random encounter tables, a template for creating fiend-infused golems, and much more! 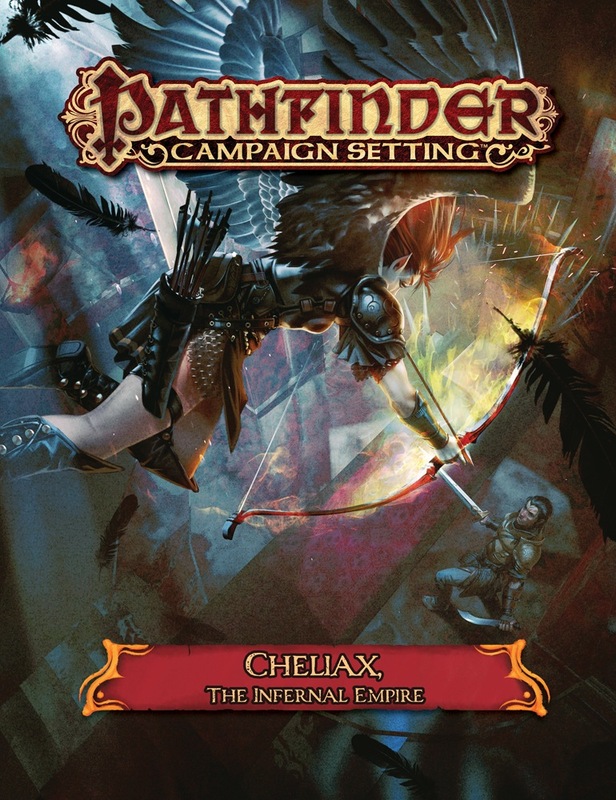 Pathfinder Campaign Setting: Cheliax, The Infernal Empire is intended for use with the Pathfinder campaign setting, but can be easily adapted to any fantasy world. A spectacular in depth look at Cheliax, it's government, people, and creatures. Essential reading for any campaign set in Cheliax, especially the three adventure paths that take place there, the Godfather-esque Council of Thieves, the rebellious minded Hell's Rebels, or the infernal affairs of Hell's Vengeance, this is the book you need to add nuance, beasties, and depth to your campaign. I am not sure if I will get this one, we will see. HOORAY! I will be getting this for sure! You always say that. You'll get this one. I know you will. Not true, I didn't get the world wound CS, demons revisited, and several from the players companion line. I am sure I'll get this one. Taldor remains the last "obvious" omission from the line. 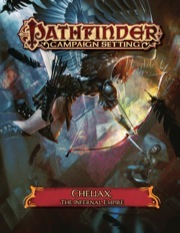 I love these Campaign setting books and can't wait to get a better look at Cheliax. I am glad we are getting the Campaign Setting books for the major powers in the Inner Sea area. First Andoran, now Cheliax. Hopefully Taldor will show up next year. This is an important book, especially given the Hell's Rebels/Hell's Vengeance double whammy. I wonder how much will be re-printed from the older Cheliax: Empire of Devils? Now this is a great way to start a day. Excellent product announcement. When did Qadira get a campaign book? I too, hope that Qadira will come along soon! Alright. I'm interested. I want to see where this goes. I am waiting for a compilation, myself. Then again I have altered "my" cheliax profoundly. hmm. Nice! I'll defiantly pick this up. More Kintargo? Pezzack? Westcrown? YIPPEE!!!!!!!!!! This will be added to my library, I promise! EDIT: Wrong thread - I was thinking of Agents of Evil. Seannoss is correct. It's Ships of the Inner Sea. I've seen it recently too, Ships of the Inner Seas maybe? There is a Chelaxian ship in it. I knew this one was coming, no we just need a Taldor and Qadira CS book. A perfect supplement to the Hell’s Rebels and Hell’s Vengeance Adventure Paths. So, for clarification, there will be a very near future Adventure Path named "Hell's Vengeance" following the release of the "Hell's Rebels" Adventure Path? There will be. Following right after Hell's Rebels, Hell's Vengeance is an AP for evil PCs starting in February 2016! Check out the Adventure Path forums for the few details we've talked about so far. I want a table of noble titles with clear explanations of where the "para-" stuff fits in. Turns out that we do too! Superb - been wondering how common, or what entails, having the "para"-title. Cheliax puts a lot of importance on titles, so that'd be helpful! That said, sorting out once and for all in print how Chelish titles work is one of many things this book will do; it's been a bit frustrating being so far in advance of the book with the development of Hell's Rebels, in fact, but hopefully that'll make the final Cheliax book here all the easier to pull together! Filthy traitors, snitching on state secrets. I damn you. Developers had better do my realm justice, or there will be Hell to pay. I am sure I will pick this up I loved the other ones. I'd very much like to see more info on places in Ustalav. Do you have Rule of Fear? If you're not satisfied with the book you can always call the Order of the Rack, I guess. I'm interested in the details of Kharijite - with is essentially being a chunk of Chelish land in Rahadoum. I've been waiting for a book on Cheliax for a while. I'll definitely get this when it comes out! Good grief, that cover, mock up or not, is super-hot! What's the page count, and is it a hardcover or softcover? I'm guessing softcover since it doesn't say 'hardcover' in the title? Assuming it follows the format of all the other Campaign Setting books, it will be a 64 page softcover. From Ships of the Inner Sea, I believe. What are the monsters in this one? Can we get a preview soon, like tomorrow? I hope it isn't delayed. Did anybody get their shipping e-mail? December feels so far away.